We are excited to share the second in our “Thumbs Up” series, where we promote a handful of recent stories of positive social impact that have inspired us. 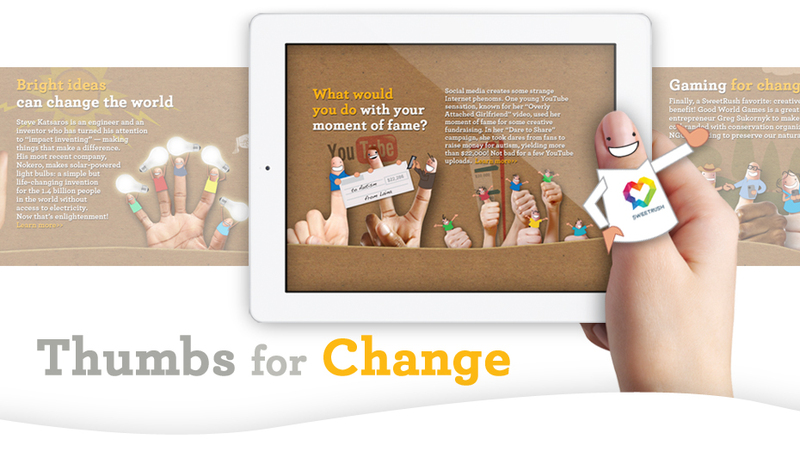 In each series, we pick a theme for ways to make a difference, find our featured stories, and put our design team to work bringing these stories to life with our fun, hand-puppet-themed, HTML storyboard interface. Last year, we focused on stories of regular people making simple choices to do good things that ended up inspiring others — us included. This year, our stories feature how businesses of all shapes and sizes — from small start-ups to the world’s largest retailers — have used their existing talents and expertise for social and environmental benefit. There were many great stories we could have chosen, but our feature picks this year came from Bridgestone Tires, Honest by, Walmart, Nokero, Good World Games, and social-media fundraising sensation Laina Walker. You can read all about those stories on our Thumbs Up page. Here we want to highlight some of the many other stories of businesses doing Good Things that we came across in our research. Let’s start at the bottom of things — feet! Toms Shoes has pioneered a simple but powerful social business model: With their “one for one” movement, they commit to giving away one product (in their case, a pair of shoes to barefoot children in need) for every product they sell. A similar model has been employed by United by Blue, a sustainable apparel company that removes one pound of trash from the ocean for every item sold. And speaking of creative ways that businesses can help remove trash from the ocean, this year the cleaning-product company Method launched a new bottle line made of a combination of post-consumer recycled plastic and plastic waste recovered from the ocean, turning very problematic ocean trash into a hip and marketable resource. At SweetRush, we are believers in the power of both individuals and businesses to do Good Things for people and the planet, and we love sharing these stories to help spread the word and celebrate other companies’ successes. As e-learning and communications experts, sharing these stories is part of our own way of doing Good Things. So check it out and share the love: Thumbs Up: Good Things come in all sizes. We are excited to share the second in our “Thumbs Up” series, where we promote..